SMRL Students Win Big Again at AIChE Mid-Atlantic Student Regional Conference! 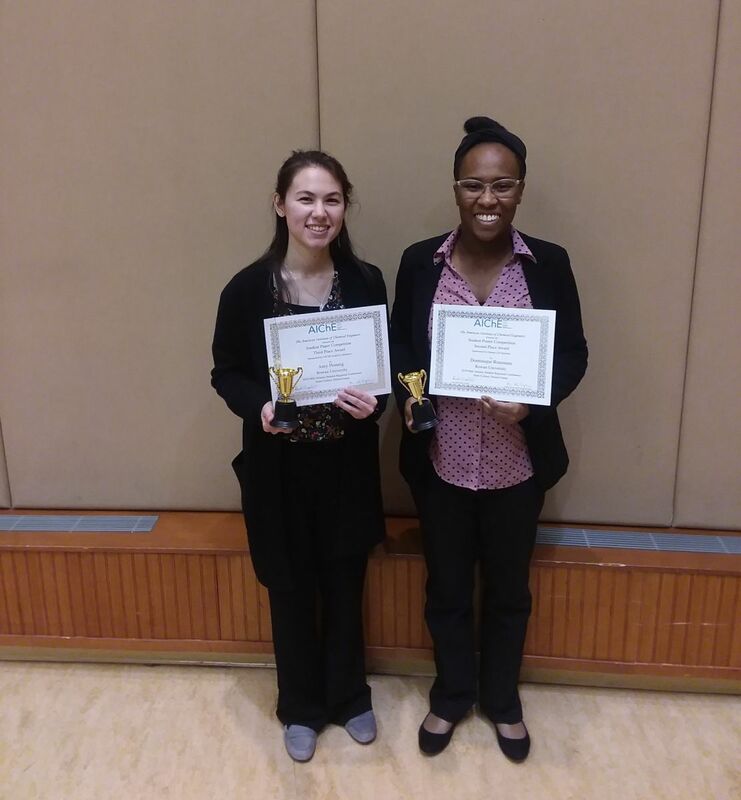 On April 7, 2019, Rowan University chemical engineering and SMRL students Amy Honnig (Senior, left in photo) and Dominique Rousseau (Senior, right in photo) took third place in the Student Paper Competition and second place in the Student Poster Competition, respectively, at the AIChE (American Institute of Chemical Engineers) Mid-Atlantic Student Regional Conference held at Penn State University. Amy Honnig received third place for her presented work titled Vanillin-based Resin for Additive Manufacturing. Coauthors include senior CHE students Claire Breyta and Ian Dunn. Project advisors include Alexander Bassett (3rd year CHE Ph.D. student) and Associate Professor Joe Stanzione. Their work is sponsored by the Army Research Labs. Dominique Rousseau received second place for her presented work titled Synthesis of Vanillyl Alcohol-based Polymer Electrolytes for Lithium Ion Batteries. Coauthors include junior CHE student Christopher Strekis. Project advisors include Elyse Baroncini (newly minted Ph.D.) and Associate Professor Joe Stanzione. Their work is sponsored by the SMART Scholarship program. Over 25 Rowan CHE undergraduate students participated in the conference. The mid-Atlantic Region of AIChE encompasses over 30 Chemical Engineering programs extending as far south as Virginia and as far north as Buffalo, NY. Students from all over the region participated in the Student Paper Competition. First-place winners earn the right to represent their regions at the National Student Paper Competition, held during the AIChE Annual Meeting. This year’s Annual Meeting will be in Orlando, FL, November 10-15. Congratulations to Rowan CHE and its AIChE Student Chapter for representing the Henry M. Rowan College of Engineering well and for a job well done!